Since the inaugural concert with Lenny Kravitz in early April, there have been two other "YouTube Presents" concerts, one featuring Panic! 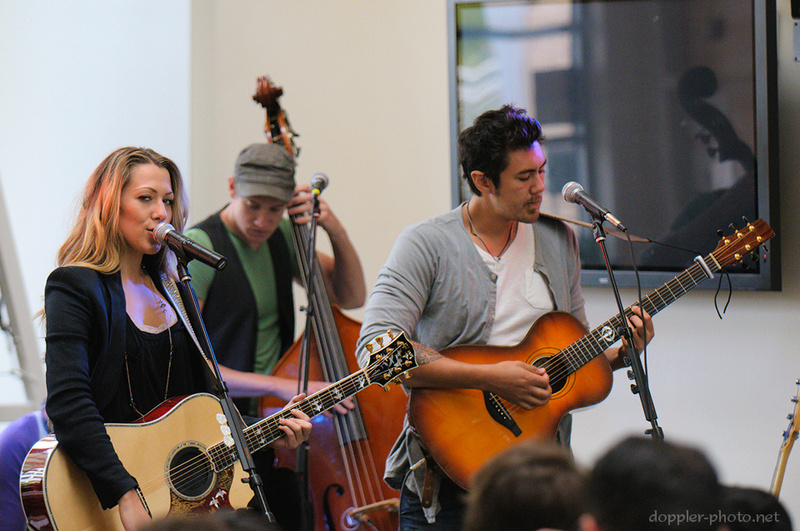 At The Disco, and the other, Colbie Caillat. Colbie's set included 4 of her 5 Gold/Platinum singles, as well as the single Brighter Than The Sun from her new album All of You. Panic! 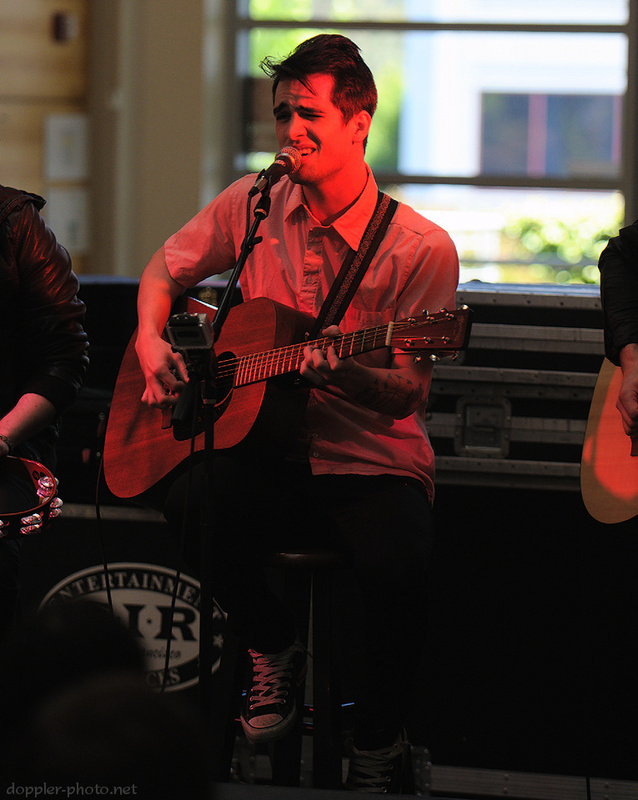 At The Disco had played a few weeks prior while on tour for their new album, Vices & Virtues. They played a short set which included the single The Ballad of Mona Lisa from that album, as well as (I believe) 2 other songs from prior albums. In all of the bands that have played at YouTube Presents so far, the percussionists seem to have formed a sort of cornerstone for each group. Panic! At The Disco is (currently) a duo, with frontman Brandon Urie and percussionist Spencer Smith (although they play with another guitarist and a bassist at shows). You'll recall that the drummer for Lenny Kravitz's band was pretty rambunctious, and with the Colbie Caillat performance, the percussionist was grinning from ear to ear while playing a cajón during one of the songs. As a side note on percussion, I was particularly impressed when Colbie's band did synchronized clapping — imagine bell-ringing but with hands only — during their performance of Brighter Than The Sun (listen for the clapping in the YouTube video). It's always neat to see what happens after the stage lights turn off. 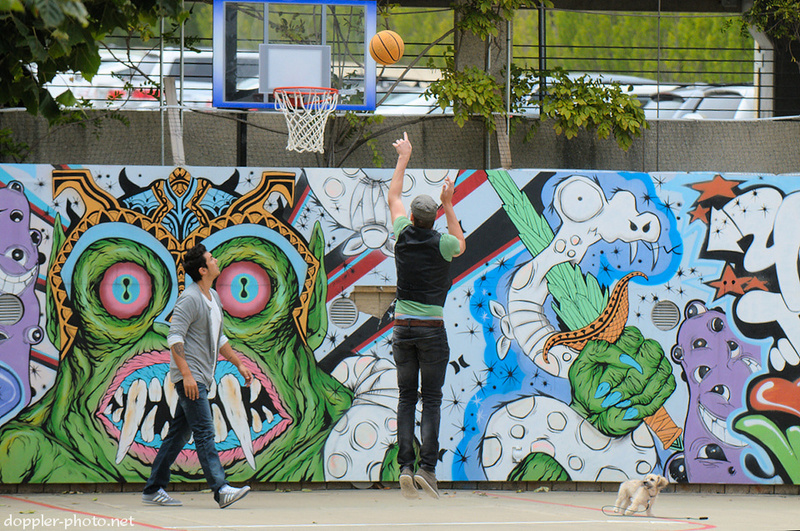 After the show, guitarist Justin Young (left) and bassist Jason (center) went outside to play some hoops in front of YouTube HQ's somewhat distinct mural. 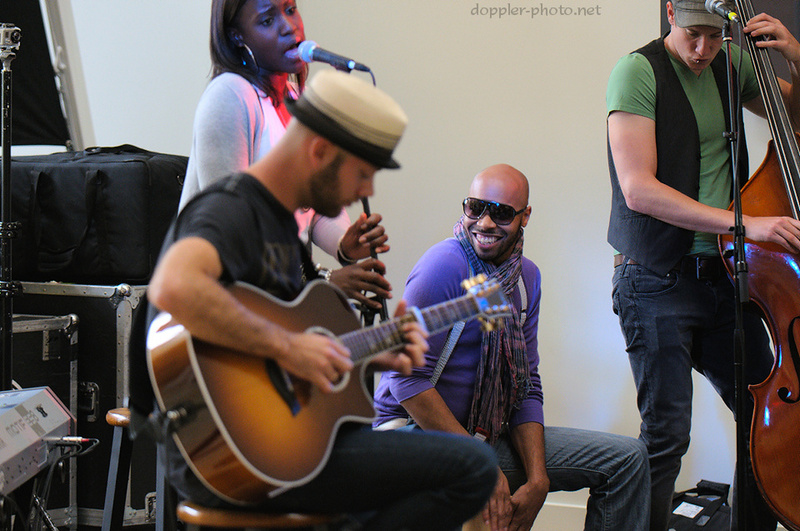 Click here to see the rest of the photos from both concerts. Jason really blends into the mural. The light green of his sleeves matches the color of the sword, and the black outline just seems to be more bold ink strokes. Just one arm is sticking out. So it looks like a character in the mural threw a basketball into the hoop.